With this One Pan Pistachio Salmon, dinner is done in about twenty-five minutes, including the ten minutes of prep time. Bonus: there’s only one pan to clean! 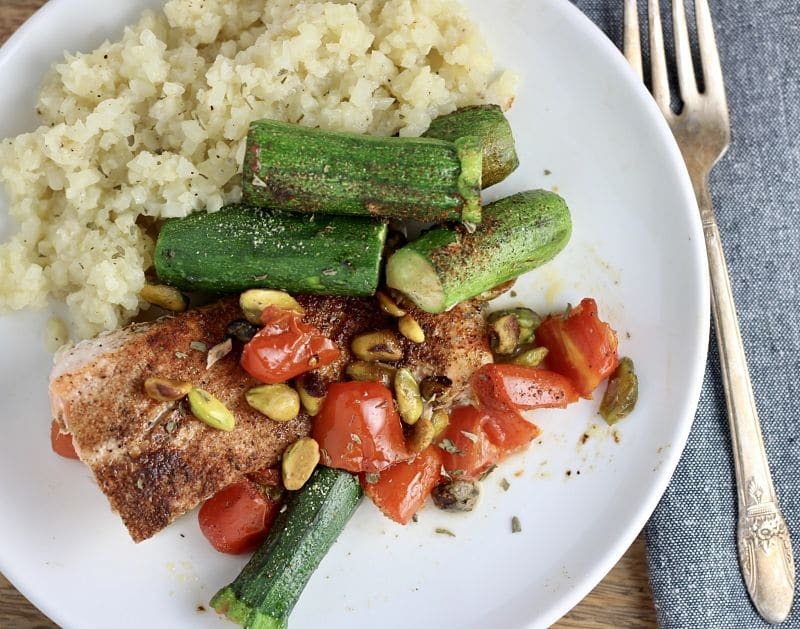 This recipe combines salmon, pistachios, baby zucchini and tomatoes for an easy, flavor-packed nutritious meal that’s gluten-free, dairy-free, low carb, paleo, whole30-compliant and keto-compliant. How’s that for a single recipe? Before I go any further, let me introduce myself. I’m Kelly Kirkendoll from Kitchen Gone Rogue and a new contributor at Recipes Worth Repeating. All of my recipes are dairy-free (thanks to my allergy to cow’s milk), and I try to keep it healthy … with a dose of indulgence. So don’t be surprised when you see a dessert recipe from me at some point! Sometimes, the simplest recipes with a few key ingredients are the best, and this salmon dish falls into that category. Let’s look at these SIMPLE ingredients. 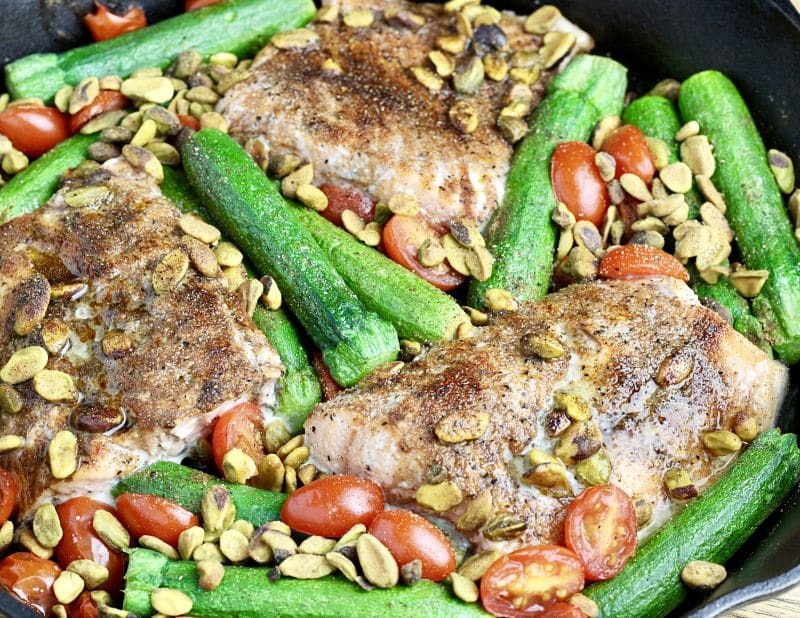 How Do You Make One Pan Pistachio Salmon? This is a really easy recipe to make and takes about ten minutes to pull together before you put it in the oven. Easy or not, I’m going to walk you through it step-by-step! 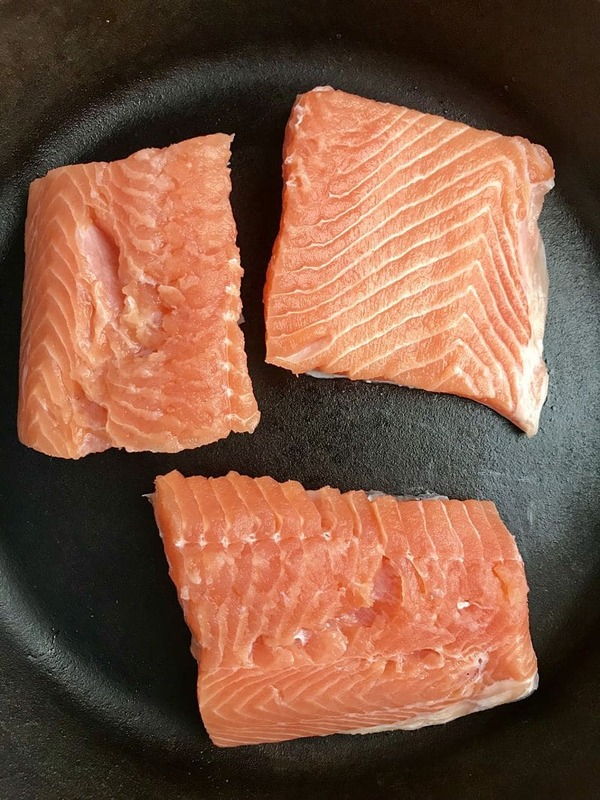 I like to make this salmon in my large cast iron skillet, but any baking dish or large skillet will do. If you didn’t have the butcher cut up your salmon for you, do that now. Using kitchen scissors makes this task and so many others much easier. Preheat the oven to 425 degrees fahrenheit. Now, put the salmon in the pan, with the skin side down. Wash your tomatoes and zucchini, then cut the cherry tomatoes in half. If your baby zucchinis are a little large, cut them in half. But, if you’re using regular zucchini, cut them into spears (somewhere between a carrot stick and a dill pickle in terms of size and shape). Personally, I prefer baby zucchini, if possible, because it saves me a step (and they’re cute). 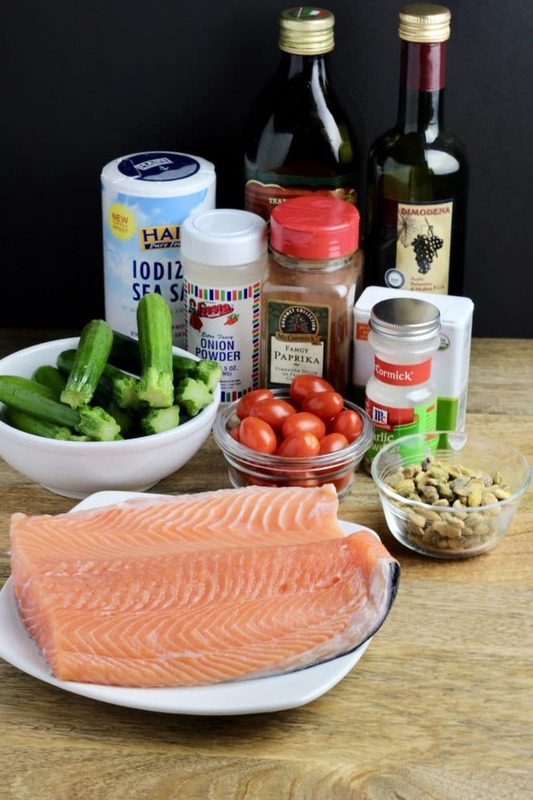 Next, arrange your vegetables in the pan around your salmon pieces, top with the pistachio nut meats, drizzle the olive oil and balsamic vinegar on top of the salmon and then sprinkle your seasoning over everything. Put the entire pan in your oven and bake 13-15 minutes (or until the salmon is cooked in the middle). Plate and enjoy! I serve this dish with a side of seasoned cauliflower rice, but you can pair it with anything you like. Easy peasy, right? It’s one of my favorite recipes! My One Pan Pistachio Salmon calls for baby zucchini, which I can typically find at a nearby store. But if you can’t, you can substitute regular zucchini cut into spears. Did you know that your grocer’s meat department will cut your salmon filets for you? Take advantage of this service!! When it comes to the pistachios, if you can’t find unsalted, then omit the 1/4 tsp salt the recipe calls for or just add a dash of salt. Maybe you prefer your zucchini on the crisper side. If so, you can keep the pieces larger. Whereas if you prefer the zucchini softer, you can make your pieces smaller. Red Thai Curry Gnocchi – another fast and easy recipe! It’s dairy-free and gluten-free (be sure to use gluten-free gnocchi). It’s also vegan, but it’s delicious with leftover turkey or chicken added. Chorizo Sweet Potato Kale Hash – this make ahead breakfast is a bit of an obsession for me right now. I could eat this dish every day (for breakfast or dinner), and I always have it up my sleeve when guests visit. Candied Jalapeno Salmon Tacos with Strawberry Avocado Salsa – these are my favorite tacos. EVER. Make sure you FOLLOW ME on Facebook, Instagram and Pinterest for more yummy recipe ideas! With this One Pan Pistachio Salmon, dinner is done in about twenty-five minutes, including the ten minutes of prep time. Bonus: there's only one pan to clean! 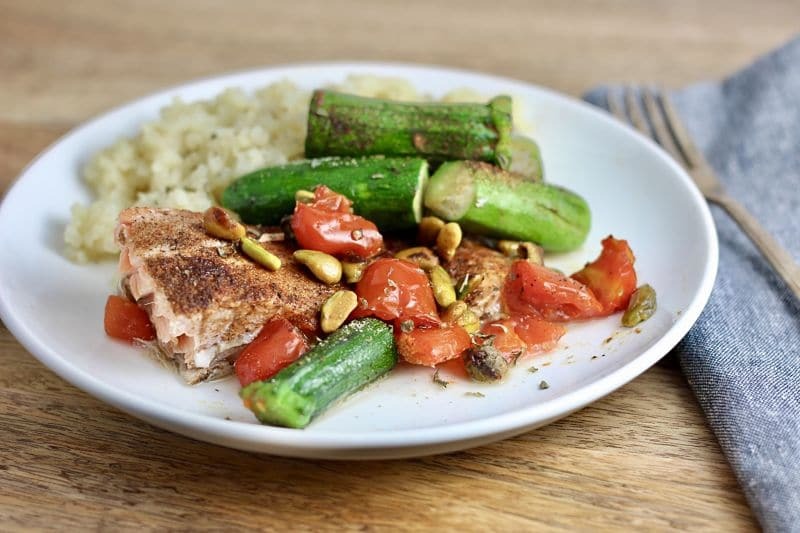 This recipe combines salmon, pistachios, baby zucchini and tomatoes for an easy, flavor-packed nutritious meal that's gluten-free, dairy-free, low carb, paleo, whole30-compliant and keto-compliant. Kelly runs Kitchen Gone Rogue, a food blog focused on dairy-free recipes, restaurant reviews and food/travel adventures. Kelly’s creations span everything from simple meals and desserts to more adventurous, gourmet creations. Yum. I love that this dish is one pan! I especially love salmon and this looks spectacular and delicious!!! I especially like the addition of pistachios!! This looks like such a tasty one pan meal. Perfect for an easy weeknight dinner, thanks for sharing! 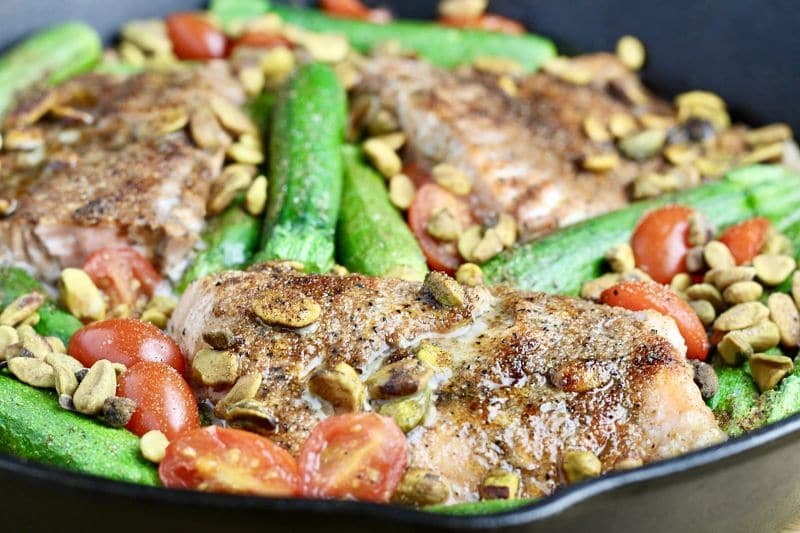 This looks absolutely delicious and I love how it is baked in one pan in the oven so it a really easy simple dish for weeknights. I don’t use pistachios enough in recipes like this so would love to try it! one pan dishes are the best! So convenient and save time in washing up! This salmon dish looks so healthy and tasty, wish this was my dinner tonight! Baked salmon is one of my favorite things to make. How special that this one all goes onto one pan. Super duper easy. Thanks for the inspiration. 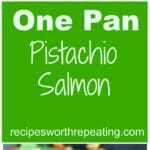 Salmon is my all-time favorite fish and the combination with pistachios is right down my alley! Such a great low-carb recipe! I can’t believe this is paleo! Love the addition of pistachios for a little added crunch. I love salmon but I’m totally guilty of always making it the same way. I love the pistachios and everything else in this dish. The family will be totally surprised when I switch it up with this! One pan recipes for a busy weeknight dinner is easy and so convenient too. That salmon with pistachios looks absolutely delicious and I wouldn’t mind it every night! 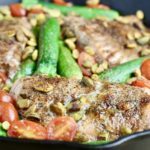 I love pistachios and one-pot meal, such a delicious looking low carb meal for anyone!